Brilliantly colored plugs feature a nonferrous metal grommet, ensuring excellent visual and metal-scan detectability, making the Laser Trak® line particularly useful in process industries employing automated inspection technology. Low-pressure polyurethane foam gently expands to fit the wearer's ear canal. Contoured T shape simplifies insertion and removal. 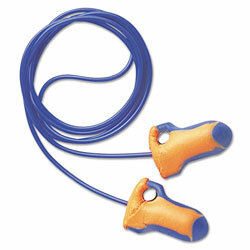 Corded/Cordless: Corded; Shape: T; Material(s): Polyurethane Foam; Brass; Noise Reduction Rate (NRR): 32 dB. Earplugs from Howard Leight! 1365 In Stock today.